​Sunday, January 31, 2016, 1:00 p.m. - 5:00 p.m. The snow date is Sunday, February 7, 2016. That is Superbowl Sunday so they may push the Expo earlier in the day. The FLL Jr. Expo is put on by the Farmington High School FRC Team, "The Enforcers." This is a great opportunity for your team to show off what they created and learned! 1) YOU DO NOT NEED TO REGISTER. Registration was done by the coaches only, and is now complete. 2) There is no fee to attend. The Glastonbury Robotics and Engineering Club made a contribution to Farmington directly so all 20 of our teams could attend at no cost. 3) Please plan to arrive a little early to get a parking spot. 4) You do not need to check in. Your coach will hand in the team roster. Since you already electronically signed the consent form on the FIRST website, you are all set! This eliminates you having to wait in a long line at the Expo and fill out a permission slip. 5) Proceed to the auditorium. Check to see if there is seating by team or not. Have a seat and relax. The organizers will kick off the event with an assembly and then we will follow their instructions when we leave the auditorium. 6) Supervise your child. After the opening, your team will have a schedule to follow. The coaches will have already set up the FLL Jr. projects in the gymnasium. Please remember that the coaches have extra responsibilities on this day, so please make sure you supervise your child. It's a long day, so you might consider leaving siblings at home, or driving separately so the whole family doesn't have to stay the whole afternoon. 7) Your child's team will stay together for the Expo. Each time will be assigned a schedule. During the "judging" time, please try to keep the kids at their table, waiting their turn. After speaking to the judges, they are welcome and encouraged to look at other models and learn about other projects. 8) Either stay for the whole awards ceremony or don't attend any part of the awards ceremony. Each team deserves a full house applauding their achievements. It is not acceptable to leave the awards ceremony before it is over, just because your team got their award and you're ready to go. You're sending a message to the other children that their project wasn't as important as the first teams that were called, and you are teaching your children bad manners. It is also rude and distracting to the announcer. If the ceremony starts later than planned and you know you will have to leave early, leave before it starts. Let's teach our children gracious professionalism. In addition to the judging portion, the Farmington High School Enforcers FRC Team has organized fun learning sessions for all the kids in classrooms throughout the school. Your team will stay together and travel to different classrooms in the high school, according to a schedule. There your kids will learn different things through fun activities, all planned and led by high school students. Remember, this is an opportunity for these teenagers to learn how to be leaders and serve the community. They are not teachers, but they usually do a decent job of it. The high school cafeteria is kind of the "hanging out" place where the kids can relax and blow off some steam. There are also activities there for the kids provided by the Farmington FRC team through their Dream FIRST program. This year there will be two groups selling snacks and drinks and they are bringing in pizza to sell. The kids selling food are trying to raise money to travel to the national FLL competition and for a girl scout troop. Your support is appreciated. If you have younger siblings attending, you may want to bring things to do, like coloring pages and crayons for them. After all the judging, the Farmington volunteers have to put together what will be said about each of the approx. 40 teams during the awards ceremony. There will be some down time waiting while they are feverishly working behind the scenes. This time is usually spent in the cafeteria. Sometimes the high school team shows science videos in the auditorium for kids that have had enough activities. You can view some of the projects during this waiting time before they are cleaned up if you didn't get enough of a chance earlier. When it's time for the awards ceremony, you may be asked to sit in a certain spot. This is because there will be SO MANY teams this year, it could get too difficult for teams to find space to sit together in the auditorium otherwise. Also, it's a good idea to have the FLL Jr. kids and coaches sitting next to the aisle, so it will be easy for them to get in and out to get their award. The awards ceremony will take over an hour given all the teams. If each team gets 2 minutes of recognition, that's 80 minutes right there. There will be loud music and a lot of celebrating. The FLL Jr. kids love it. After participating in FLL this year with the older children, I can tell you that it is wonderful that every team is recognized at this Expo - and not just their name mentioned, but something about what the team learned. All the kids leave HAPPY and PROUD of their accomplishment! Each participant will get something to take home. G-REC contributed to the purchase of the awards for the Glastonbury teams. Coaches need to arrive between noon and 12:30 p.m. There is a coach meeting at the back of the gym at 12:40 p.m. Please make sure at least one coach from each team attends. Thank you! Please read the info for parents on the left to make sure you are up to speed on the day. Before you set up your model and poster, please hand in your team's roster at the registration desk. Once your model and poster are set up in the gym, you can join your team in the auditorium. Coats, etc. can be stored under the table where the model will be displayed in the gym. Just make sure everyone picks them up BEFORE the awards ceremony! __ Lots of patience and a good attitude!!! 3) Join your team members and fellow parents in the auditorium. 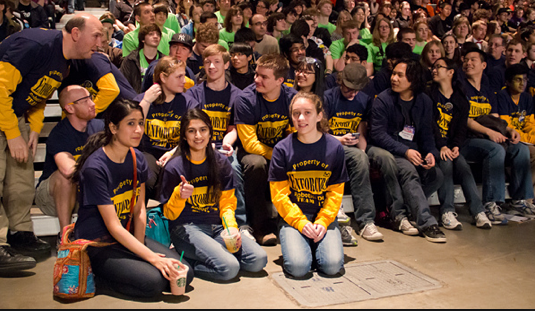 4) Follow your team's schedule and enjoy the Expo! 5) After the judging/open viewing times, please pack up your model and poster BEFORE the awards ceremony, because other groups need the gymnasium, starting at 4:45 p.m.
7) Consider planning a team celebration in addition to the Expo. FIRST used to create certificates of participation you could print and fill in, but I can't find any this year. We've created our own in Power Point; email greccoach@gmail.com if you want a copy of the file to adapt for your team. You will need to bring your official printed roster. Even if you put it in the blue folder, I may see you at the start of the event. So BEFORE the Expo, you'll need to sign into the Jr. FLL TIMS website (https://my.usfirst.org/jr.fll/tims/site.lasso) and login in. Click on Team Summary, and at the bottom of the summary page you will see a button to View the Team Roster. Then you can click on "printable roster" and print. I do NOT have access to your rosters, so I cannot check them online or print them for you. Only the two coaches have access, so you need to make sure you bring this form on the day of the Expo.